A quick run to the store, some trimming and banging around, and we now have seven full shelves on one wall. Still to install are shelves on the wall above the fridge, and of course all the little finishing bits. We spent a celebratory few minutes moving some stuff from around the kitchen and the other pantry onto the shelves here. Most of the upper shelves will be filled with kitchen things we have stored in the basement (party supplies, more seasonal equipment, and so on). It's just nice to have ample shelf space. Somehow over the years we have managed to fill the other pantry pretty full (even considering that we regained a bunch of space when John moved out). Perhaps that is somehow related to the fact that I discovered that I have four kinds of cocoa and five kinds of sugar (not including coloured decorative sugar) in my baking supplies. I guess it's time to do some baking and plow through some of that stuff. 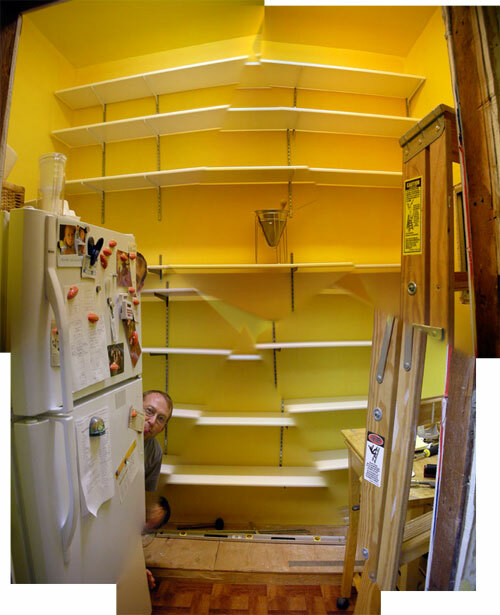 Wow - they're like some crazy, Dada-esque shelves in the first picture! Look a post back and see if you can tell where vertical is. I love how photostitching messes with the perspective. I had a similar experience. When I moved a bunch of stuff around and consolidated all of my canned goods, I discovered a startlingly large collection of exotic rice. Maybe I should have an exotic rice tasting party. Herself: I'll bring the sugar. 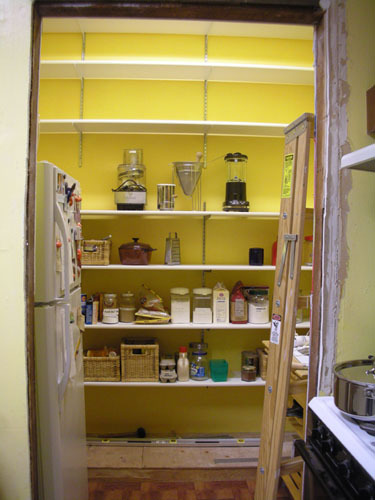 I've been following your renovations for a while now, and I really feel your excitement when you've reached an accomplishment like the food closet. You see, I grew up in house similar to yours back here in New England. It was a small Victorian farmhouse built in 1874 that had been through the wringer. We had concrete walls in some rooms because the previous owners had used it to patch holes! There was one room that had dark brown woodwork and pink trim. My mom wouldn't let either of us sleep in there until it was renovated. As my dad and I redid the house inside, it became our home. It wasn't renovated into a totally period Victorian. Like your house, we had our taste that suited the house well yet represented our tates. During the renovations, we added two rooms to the house - a kitchen and an art studio because my dad is a fine artist and ran a design business, and when it came to meal time, the ordeal was spread between three different rooms. I've since moved away from the house, yet I still dream about it when I dream about being "home". I never include the new house in the dreams; just my old one that became my house. These old houses have a personality that is unlike anything that I've ever felt or seen. When they've been given a nice renovation and fixed up nicely, they pay back with a warmth and color that is never felt in a modern house. Thanks for the note, John. There is something about an older house that feels more like home to us, too. I think it's especially true when it's a house you've worked on yourself.